Less than a decade ago, the International Monetary Fund used to talk about Asian countries piling up too much in their currency-reserve stockpiles. The global financial crisis turned that conclusion on its head, and now that U.S. interest rates are poised to keep climbing, the race is on to identify which countries have the strongest buffers against capital flowing out toward developed markets. A measure developed by the IMF itself shows that Thailand and the Philippines may be best placed to withstand further downward pressure on the emerging currencies in Asia, based on calculations taken before the Donald Trump-induced U.S. reflation play roiled the foreign-exchange market. The IMF last month forecast Thailand’s reserves at $163.3 billion at year-end, compared with the $64.9 billion needed according to the so-called Assessing Reserve Adequacy gauge, which incorporates criteria from short-term debt to money supply, imports and investment flows. The Philippines was heading for a $84 billion hoard, against a $31 billion need. 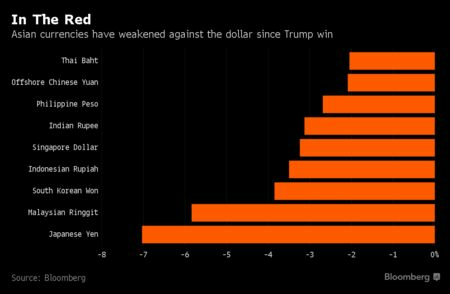 The measure shows Malaysia — not coincidentally the worst performing of the major emerging Asian currencies against the dollar this month — faring poorly by comparison, with a $100 billion reserves projection against short-term external debt of $128.2 billion, based on IMF estimates. Looking beyond Asia, Turkey, South Africa and Mexico are among those deemed more vulnerable by the assessments. “Both Thailand and the Philippines increased their reserves in the last couple of years and have adequate buffers to intervene to smooth currency volatility,” said Khoon Goh, head of Asia research at Australia & New Zealand Banking Group Ltd. in Singapore. Malaysia’s reserves are well down from a May 2013 high, and the slimmer adequacy ratio “limits the ability for BNM to intervene,” he said, using the initials for the country’s central bank. 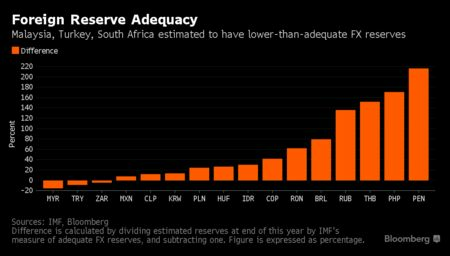 Nations across Asia have already been deploying their reserves, in the form of intervention to prevent disorderly declines, likely making the IMF’s year-end projections unattainable. Even with its added resilience, the Philippines saw its peso drop to 50.00 per dollar for the first time in eight years Thursday. Reserve accumulation started becoming a focus after emerging Asian economies were hammered by plunging currencies during the Asian financial crisis of 1997-98, when policy makers quickly burned through their holdings. A tough lesson during the global crisis last decade was that even robust reserves may not be sufficient when investors sought only the safest assets. The Federal Reserve ultimately shored up the global system through offering U.S. dollar liquidity through swap agreements with counterparts spanning the globe. This time round, it’s less fear that’s gripping markets than optimism about faster inflation in developed economies should the incoming Trump administration succeed in expanding fiscal stimulus. That’s accelerated fund outflows from the emerging markets. International investors sold more than $12 billion of equities and bonds in Asia’s emerging markets since Trump’s victory and the Bloomberg-JPMorgan Asia Dollar Index reached the lowest level since March 2009.